Consideration of a proposal to redefine everyday timekeeping by scrapping leap seconds - small changes made to clock time - has been postponed. A working party weighing the proposed change to Coordinated Universal Time (UTC) has decided more time is needed to build a consensus on the issue. Leap seconds synchronise clock time with solar time used by astronomers. The US delegation to the International Telecommunications Union (ITU) wants to abolish these adjustments to UTC. Tidal friction is causing the Earth's rotation to slow down. This means that everyday timekeeping, based on the rotation of the Earth (solar time), tends to drift out of sync with respect to the time kept by atomic clocks. For this reason, the standard for everyday timekeeping, known as Coordinated Universal Time, or UTC, must be adjusted every so often. This takes the form of individual seconds being added or subtracted from the length of a day, either a 30 June or a 31 December. The first leap second in seven years will be added at the end of 2005. In this way, clock time is kept in step with solar time, which is used to precisely point telescopes and to find satellites. The new proposal, originally tabled for discussion at the ITU meeting in Geneva last Wednesday, proposes that the maximum difference between UTC and solar time be increased to an hour. In a statement, the ITU working party said: "The working party has discussed the proposed change and options, and decided that more time is required to build consensus. "In addition, the forthcoming leap second just prior to 1 January 2006 provides an opportunity to further document current problems." Dr Mike Hapgood, secretary of the Royal Astronomical Society (RAS) in the UK, welcomed the decision to defer the discussions until a later date. "It's what we were seeking, so that's good from our point of view," he told the BBC News website. It is understood that software issues with the US global positioning system (GPS) sat-nav network are partly driving the proposal. As well as satellite positioning, GPS provides a time signal, and some software systems used in the sat-nav system find it hard to cope with leap seconds. 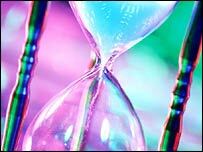 Leap seconds also create difficulties for computer programmers making calculations using time. However, without the leap second, astronomers would lose track of distant stars and spacecraft. And the idea of clock time following solar time is also deeply embedded in contemporary culture. Researchers estimate that the difference between UTC and Earth time could increase to about an hour within several hundred years. Daniel Gambis, of the Earth Rotation Service in Paris, which decides when to add or subtract leap seconds, told the BBC: "For me, it would be a problem if the Sun were to rise at 4pm or at a different time like noon or midnight. "I don't support the idea of the American delegation because I think all our human activities are linked to the rotation of the Earth first." The UK's Department of Trade and Industry (DTI) is co-ordinating its own response to the American proposal.